If you’re wondering whether or not you can apply oil-based paint over latex, it really isn’t a smart decision, but it is possible. 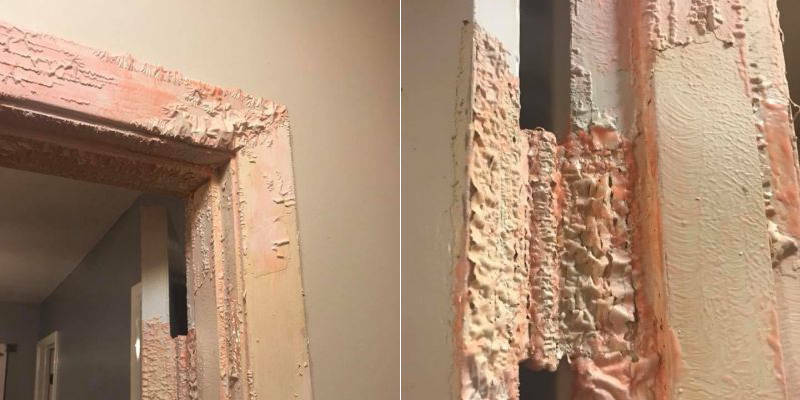 The reason professionals advise against doing this is because latex paint is flexible in nature, and as a result, oil-based paints won’t properly adhere to them. If it is not done properly, it makes a normal paint job take much longer. As previously mentioned, latex is flexible in nature. As a result, oil-based paint won’t properly adhere to latex unless you sand the surface and add primer between each of the layers. Start by equipping yourself with a piece of P80 grit sandpaper and try to remove as much of the latex from the surface. You can also use a sanding block. By removing the latex from the surface, the oil-based paint will adhere much better than if the latex was left on. Make sure you sand the surface down until you get a real matte look. You’ll now want use 150 grit sandpaper and sand until you get a surface that’s extremely smooth. After the surface has been completely sanded, wipe away the dust left behind with a damp towel or a clean cloth and let the surface to completely dry. Using a quality masking tape, you’ll want to mask anything you don’t want accidentally painted. This can include things like the edges of adjoining walls, the edges of your cabinets, the edges of a light switch, and so on. Masking helps you get that really clean, sharp look when you’re finished painting and everything is fully dried. You have the choice between a water-based or acrylic primer. Each of these primers work well and have their pros and cons. Both water-based and acrylic primers create the perfect isolating surface. After you have applied the primer, and it’s fully dried, you’ll want to go ahead and apply a second coat. It’s important to make sure you covered every single piece of latex possible. You’ll need a container of oil-based top coat. This can be purchased at most home improvement stores. After you have applied this solution, give it adequate time to dry, and if need be, apply another coat for superior coverage. It’s best to remove all the masking tape before the paint fully dries. Removing the masking after the paint has fully dried can cause the paint to tear, break, or chip. Now that you know how apply oil-based paint to latex, the question remains. Can you paint latex over oil-based paint? The answer is yes, but the thing you haver to remember is, once you apply latex over an oil-based paint, the only way to remove it is to sand it off. That can become quite a nightmare, so make sure you get it right the first time. To ensure the surface is fully sanded, and make sure you don’t see any sort of shine. You’ll want to see more of a matte surface. This sanding should be done with a 150 grit paper. To make sure you get sharp, clean-cut edges, mask the surrounding area with a quality masking tape. Remove the masking tape when you’re done painting and the paint is still moist. Like mentioned above, removing the masking tape when the paint has fully dried can chip, rip, or break the paint off. Once the surface has been fully sanded, you’ll want to apply a layer of latex ‘conversion’ primer paint. Make sure you give it adequate time to dry and you cover all areas of the surface you’re painting. Lastly, apply your oil-based paint and let it dry. When the latex ‘conversion’ primer and your oil-based paint mix, they allow your oil-based paint to adhere with no issues.